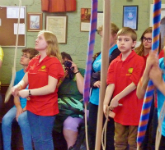 The Ringing World National Youth Contest is a recent success that has been growing over the last few years from just a striking competition for under 19s to being an amazing day out with lots of different activities and ringing going on across a city. 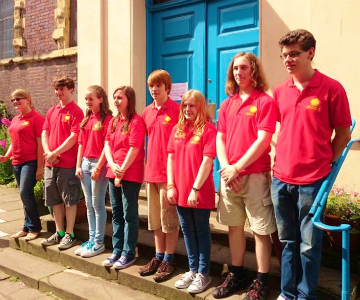 This year’s Ringing World National Youth Contest (RWNYC) held on Saturday 5 July was hosted by Worcester with the competition bells being the back 8 of the lightest ring of 10 in the country; Old St Martins in the Cornmarket. This is the 4th year the contest has taken place and the 3rd time Suffolk has entered a band. Suffolk Young ringers were drawn to ring last of the 16 teams who had gathered from all over the country. On top of this, unlike previous years, we had the ability to bring along a whole group of ringers, 31 to be exact! 15 of those came along on the minibus and in total 28 came up the night before to stay at the University of Worcester. The young ringers of the Suffolk had been meeting monthly since September and our final practice was at Henley where a certain ringer with the initials GMS managed to break the rope of the treble in one pull. A sign of things to come? As well as ‘the team’ 10 other young ringers from all over Suffolk were involved in the whole build up to the contest and the day itself. This includes- Jasmine Ives- Bardwell, Matthew Rolph- Halesworth, Jack Robinson- Mildenhall, Richard Stevens- Rendham, Claire & Rebecca Last and Clara Gostling- Sproughton, Clare Veal & Ruth Eyles- Great Barton, Emma Driver- Parham. After a good night’s sleep and an excellent breakfast we had a lovely walk along the river Severn up to the cathedral where we registered. After a brief talk the team and some of their supporters went to St John the Baptist in Bedwardine, a smooth 15 cwt eight that were recently rehung, where the team grabbed hold in their positions and rang a very respectable course of Plain Bob Triples. After this the team then split off into little groups and then spent a few hours roaming around Worcester ringing with many other young ringers from around the UK. All the towers in Worcester were open and all tower captains were very welcoming to anyone of any ability. The same can be said of Tom Hinks running the handbells who as always did a super job at running all sorts of things from rounds to Bristol. At about midday most of the team met up for the 12 bell master class being run by Simon Linford, the chief judge at the last contest, on the fine 20cwt 12 of All Saints. 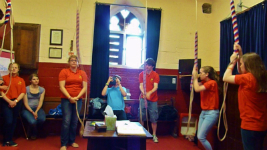 This was an introduction to 12 bell ringing with 8 experienced ringers and 4 young ringers in at any one time to give the them great go at taking part in some very good 12 bell striking. Shortly after this it was Suffolk’s slot at the teaching centre. This is an amazing facility where 8 dumbells are hung in a room below the ringing chamber of the cathedral and each bell is connected to a laptop with Abel installed. It is a fantastic facility for all ringers of all abilities and the young ringers and supporters who attended this session got a great deal from it. After some ringing at the other towers in Worcester we met up back at Old St Martins in Cornmarket to ring the test piece, with some arriving more promptly than others! The practice touch went well but there was room for improvement after a quick team talk the signal was given and we began the test piece. We were all was pleased with how the team rang as it had no methods mistakes and it was a great improvement from our test piece! Overall a good effort that the whole band and Suffolk should be proud of. As we rang last in the day the next thing to do was go to the ringing at the Cathedral. These are a two ton 12 that can be a little tricky for novice ringers though everyone from Suffolk did not disgrace themselves and even the less experienced young ringers from Suffolk put some older ringers to shame. A service touches of call changes were rung by bands of invited young ringers including George and Colin. Then everyone involved with the competition met up in college hall at the back of the Cathedral and Mark Regan started to introduce the judges. Alistair Cherry, Andrew Rawlinson, Ed Mack, David Pipe (Chief) were the judges and apart from David they were all young ringers! The results where then given and Suffolk came 3rd in the method category with a B+, our best result so far! This meant that if you put all 16 teams together we came 4th with Bedfordshire winning again with an A* in call changes. The whole team are thrilled to have done so well and represented Suffolk in such an amazing competition. We are also very proud to have chosen to ring a method when other teams who are much more able than our own chose to ring call changes. To be able to produce a method team of ringers who are under 19 is great achievement and it shows that Suffolk is leading the way in encouraging young people in to ringing and makes the future of ringing in Suffolk that little bit brighter. On behalf of everyone who was involved with team and the contest we have to say a huge thank you for all the support. From buying raffle tickets to organising the accommodation and transport, thank you! It is excellent to know that Suffolk’s young ringers are being supported by those around them to achieve the very best they can. Next year's contest in to be held on 11th July in Oxford. We plan to begin the 2015 campaign with our first practice some time in September. We want all young ringers from across the county to come along and joins us. We are a friendly bunch (really we are!!) and whilst we work hard to achieve a high standard we do so while having fun.